Heat oven to 350°F. Grease and flour two 8- or 9-inch round cake pans, or 13x9-inch pan. In large bowl, beat all cake ingredients with electric mixer on low speed 30 seconds, scraping bowl constantly. Beat on high speed 3 minutes, scraping bowl occasionally. Pour into pans. In medium bowl, mix powdered sugar and butter with spoon or electric mixer on low speed. Stir in vanilla and enough milk until smooth and spreadable. Fill and frost round layers or frost top of rectangle with frosting. The slight red tint in this cake comes from the reaction between the acid in both the buttermilk and chocolate and the alkaline base of the baking soda. 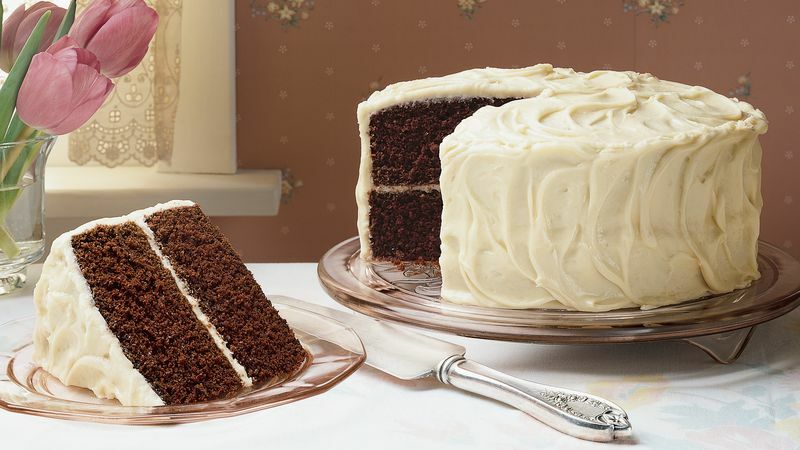 Make it even easier by using Betty Crocker® Whipped ready-to-spread vanilla frosting instead of the scratch frosting. You’ll need about 1 1/2 containers to frost this two-layer cake.